Open social innovation is defined as “the creative destruction that aims at making up new processes that can be appropriated by the whole of civil society” (Peña-López, 2014). One common denominator that can be found in successful initiatives that deal about political participation and engagement is that they use ICTs to remove barriers and/or equal the ground of participation (leaping the knowledge gap), create new platforms and projects shared by broad and multi-stakeholder communities (new processes phase) whose outputs and outcomes positively impact on the community and, at the same time, achieve reasonable levels of economical and especially social (self)sustainability (leveraging quadruple helix). In the figure below we have drawn a scheme that aims to synthesise the common points that we have found in our review of cases and that are also pointed at in the literature. In the following sections we will explain how the initiatives we analyzed address each of the four layers into which we schematized their operational design and why addressing every layer is crucial for the final success of the project. In 1970, Tichenor et al. showed how mass media consumption did not necessarily had an evenly distributed positive impact on people’s knowledge. On the contrary, the impact depended on the point of departure, being much more significant on more highly educated segments of society. Thus, exposition to information depended on socio-economic status and did not add up to the pre-existing knowledge levels of the population, but had a multiplier effect: educated people will do better, uneducated people will do worse. This “knowledge gap hypothesis” has proven true not only related to information coming from mass media, but from other knowledge devices such as public libraries (Neuman & Celano, 2006), the Internet in general (Bonfadelli, 2002; Selwyn et al., 2005; Van Deursen & van Dijk, 2013), instructional technology (Warschauer et al., 2004; Warschauer, 2008; Warschauer & Matuchniak, 2010; Horrigan, 2016; Patterson & Patterson; 2017) or social media and e-participation platforms (Yang & Zhiyong Lan, 2010; Anduiza et al., 2012; Robles et al, 2012; Schlozman, 2012; Gainous et al., 2013). Successful participation usually address as a first stance this situation. When addressing inequalities is not their first stance —such as in the case of projects explicitly addressed to employment— most projects include accompanying measures that aim at leveling the ground so that, according to their means, all players can engage in equal conditions. At this level, which we call the point of departure, it is important that there are instruments that contribute to leap the knowledge gap by providing basic and operational resources that enable objective choice (Welzel et al, 2003). In general, this stage is especially suitable for policies and programmes that address basic needs of the youth in particular and the citizenry in general. Beyond the obvious fact that individual development and progress is good per se, we want keep on stressing the fact that we have already stated: further measures to empower citizens will only work as desired if there are former leveling initiatives. Thus, formal education initiatives or employment programmes should be thought as a pre-requisite of higher level measures so that these can act as appropriate multipliers. Once individuals are in (more or less) good conditions to be actual and active citizens, what naturally comes is that they coordinate to collectively promote initiatives. The more intertwined these citizens and their respective collectives are, the more resilient, sustainable, scalable and replicable their initiatives are. If basic conditions are a requisite for leveling participation and thus avoiding the unwanted outcomes of the knowledge gap, a tight social tissue increases the possibilities of success of a given social initiative. Projects that plan ahead in this train of thought, design devices to enable social tissue creation or to strengthen the existing one. Financial resources, facilitators (such as social workers), members of the Administration or researchers that bring in background and context, etc. contribute to this goal. Not surprisingly, face to face initiatives are more common at this stage, as they are welcome as better weavers of this social tissue. On the other hand, at this stage it is also worth noting that local leaders easily emerge when grassroots movements are fostered. Being crucial the strengthening of the social tissue, local leaders and grassroots movements, the role of the government has to be stealth: the government thus becomes a platform that provides context, facilitates and fosters interaction while staying in the background. Attempts of the government to move to the forefront are usually perceived as patronizing or intrusive, and thus have a discouraging effect. At this stage, Internet and social media initiatives should be addressed towards access to information and knowledge management, especially in knowledge-intensive sectors of both the productive economy and the civil society. But not only, digital skills on building digital personae or digital identities are key at this level so that the weaving of the social tissue can go beyond the local arena and, as we will see below, overcome barriers of time and space and enter the field of networking. Citizens are usually part of different collectives and collectives usually operate at different levels or layers. Networks contribute to the exchange of knowledge between scattered individuals and collectives which would otherwise act as isolated nodes. But not only networks contribute to the articulation of collectives of collectives, but also contribute to the diversification of the typology of individuals and collectives involved in a given initiative. Networks become useful instruments to articulate multi-stakeholder partnerships —formally or tacitly— and, if well balanced in their nature, these networks can promote interactions and exchanges between governments, higher education and research organizations, the industry and civil society organizations. The Quadruple helix model of innovation posits (European Commission, 2016) that only such kinds of interactions between these four types of actors can really produce innovations that do respond to the needs of the society at large. We have found that the synchronization of layers is achieved by successful projects by means of networks. And that this synchronization is most of the times achieved by means of online platforms and other digital constructs. At this point, digital literacy (information literacy and media literacy) become a key aspect for further developments. On the one hand, because networks (either facilitated by digital means or not) have a logic that is much different from industrial hierarchical models. On the other hand, because, when powered by digital platforms, its mere operation does require capacitation in a broad range of digital skills. Networks, in a knowledge society, heavily rely on the gift economy and the ability to concentrate and distribute information that can be applied locally as knowledge. It is thus worth bearing in mind the complex constellation of literacies and competences that can be labelled as digital skills: technological literacy, informational literacy, media literacy, digital identity or e-awareness are just some of the names and concepts that are part of a set of skills that enable or foster other ones like creativity, teamworking, leadership or critical solving – or, in other words, XXIst-century skills (Ananiadou & Claro, 2006; OECD 2016a, 2016b). If weaving the social tissue was the way to leverage the potential of now equal and individual citizens, institutionalization is the way to leverage the potential of quadruple helix-like networks. Many projects aim at raising their goals at the upmost level and seeing them going mainstream. Only institutions, through regulation and policy-making can realize this aspiration. Of course, most projects do not get to see their designs mainstreamed, especially during their limited time-spans. Thus, their proxy goal to mainstreaming and institutionalization is visibility. Successful projects are strong in advocacy and awareness rising, and they do it in two opposite directions. Firstly, as we just stated, by looking “up” towards the institutions, by showcasing and modelling, by comparing with other related projects. Secondly, by looking “down” to their communities, by assessing and evaluating their impacts, providing feedback to their citizens. This double aim —mainstreaming by “looking up” and laying strong foundations for social sustainability— are typical of successful projects. It is interesting to note how this stage is both the end of the process but also the beginning of a virtuous circle. On the one hand, it aims at creating social infrastructures —policy, regulation, institutions— so that the benefits of the projects can become structural and not temporary, as embedding them in established and stable social structures are the best bet for replication, scalability and sustainability at large. On the other hand, by establishing a dialogue with the citizens and looking for the individual impact, they address —this time with a top-down approach— the socio-economic layer where the whole process began in the first place. Ananiadou, K. & Claro, M. (2009). 21st Century Skills and Competences for New Millennium Learners in OECD Countries. OECD Education Working Papers, No. 41. Paris: OECD Publishing. Anduiza, E., Gallego, A. & Jorba, L. (2012). “Internet use and the political knowledge gap in Spain”. In Revista Internacional de Sociología, 70 (1), 129-151. Barcelona: IGOP. European Commission (2016). Open Innovation 2.0 Yearbook. Edition 2016. Brussels: European Commission. Horrigan, J.B. (2016). Lifelong Learning and Technology. Washington, DC: Pew Internet & American Life Project. Neuman, S.B. & Celano, D. (2006). “The Knowledge Gap: Implications of Leveling the Playing Field for Low-Income and Middle-Income Children”. In Reading Research Quarterly, 41 (2), 176–201. Newark: International Reading Association. OECD (2016a). Skills for a Digital World. 2016 Ministerial Meeting on the Digital Economy Background Report. Paris: OECD. OECD (2016b). New Skills for the Digital Economy. Paris: OECD. Patterson, R.W. & Patterson, R.M. (2017). “Computers and productivity: Evidence from laptop use in the college classroom”. In Economics of Education Review, 57, 66–79. London: Elsevier. Selwyn, N., Gorard, S. & Furlong, J. (2005). “Whose Internet is it Anyway? : Exploring Adults’ (Non)Use of the Internet in Everyday Life”. In European Journal of Communication, 17 (1). London: SAGE Publications. Tichenor, P.J., Donohue, G.A. & Olien, C.N. (1970). “Mass media flow and differential growth in knowledge”. In Public Opinion Quarterly, 34 (2), 159 – 170. Oxford: Oxford University Press. Warschauer, M., Knobel, M. & Stone, L. (2004). “Technology and Equity in Schooling: Deconstructing the Digital Divide”. In Educational Policy, 18 (4), 562-588. London: SAGE Publications. Warschauer, M. (2008). “Laptops and Literacy: A Multi-Site Case Study”. In Pedagogies: An International Journal, 3 (1), 52-67. Abingdon: Taylor & Francis. Warschauer, M. & Matuchniak, T. (2010). “New technology and digital worlds: Analyzing evidence of equity in access, use, and outcomes”. In Review of Research in Education, 34 (1), 179-225. London: American Educational Research Association. Peña-López, I. 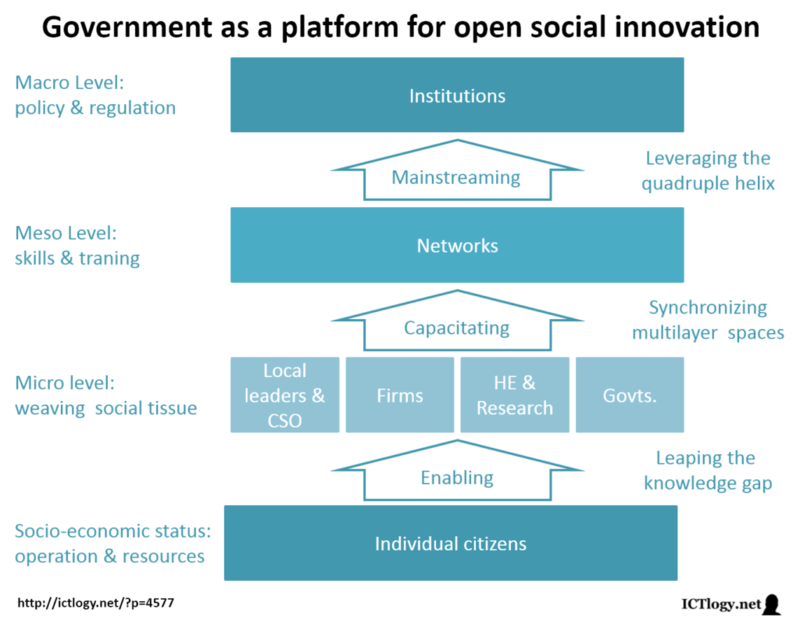 (2017) “Government as a platform for open social innovation” In ICTlogy, #170, November 2017. Barcelona: ICTlogy. Previous post: Appropriating Technology for Accountability (XII). So what?